1. Prepare vinaigrette: whisk all the vinaigrette ingredients in a bowl and set aside. 2. Toss salad leaves, hazelnuts and vinaigrette in a large bowl. 3. Wash, core and slice the pears. 4. Arrange the pears on a large platter or divide among 4 individual plates. 5. 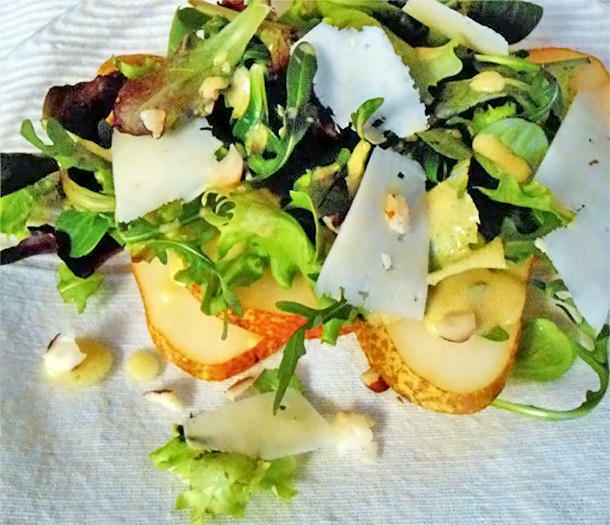 Place the salad greens over the pears and garnish with the cheese slices.